Welcome back for another Compendium of Curiosities Challenge! Here we are on challenge #29...can you believe it? We are well into a year of challenges and I can tell you that these challenges have pushed me, made me try things and definitely challenged me at times, hehehe. I hope you will join us and play along. Just make sure to follow the rules laid out here for you...they are really easy peasy! It certainly has been an amazing journey that I am thankful for and thankful for the people that it has brought into my life! As always let's take care of housekeeping, shall we? Inspiration Emporium has donated a very generous gift certificate and of course Tim and Mario who donated a HUGE assortment of goodies to be given away throughout the challenge! I hope you have a copy of the book by now, but if you don't you can still order it from Tim and Mario and it will even be a signed copy! Heck yeah! Okay...so today's challenge can be found on page 44 of Compendium of Curiosities Vol. III. It is called Eroded Metallic...oh do I love this one. I have actually never done it before making the piece for this challenge, but I think I fell in love, wink. I used a 5 x 7 canvas as my background. Applied said technique to three tags and then cut them to size. I also tried the technique on Tim's Butterfly Die...I LOVE it. It is whimsy and fun. It was really hard to photograph and get the honest to goodness feel of it, but let's just say I did a very awkward happy dance with a hurt back, lol. Not a good thing hehehe. Added some embellishments and a sentiment and there you have it. I chose some of Tim's chit chat to put on the left side of the canvas that I thought went along with the sentiment. 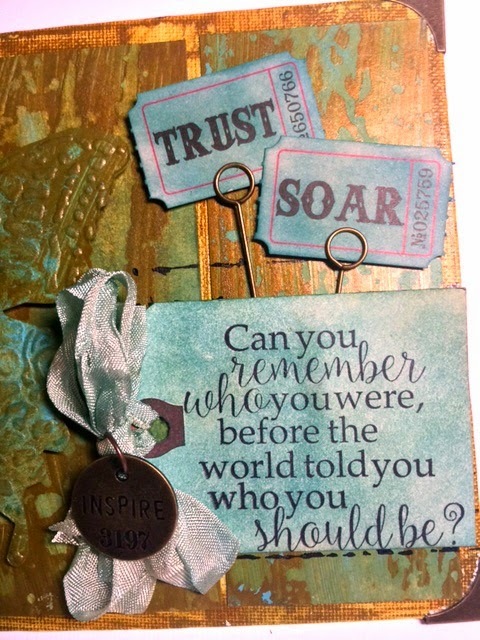 Trust and Soar ticket stubs because I just love them, wink. The corked vial is filled with gold glitter. Just to add a little sparkle. hehehe. Okay...I'm off to check out what the rest of the Curiosity Crew has been up to. I hope you will make your way around...and make sure and check out what your fellow challengers are up to as well! It is amazing to see the same technique always so different and diverse! Have a great week! HUGS...and no awkward happy dancing for you, wink. Yvonne...your canvas is so pretty!! One question...where's the pink? Haha. Just kidding! The luscious teals are right up my alley. 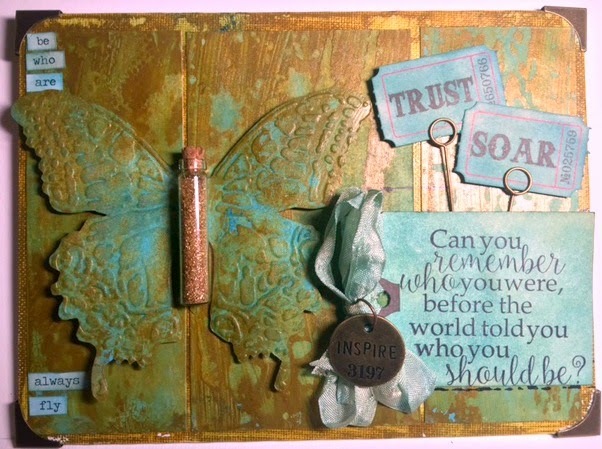 Love your embossed butterfly. So pretty! The little vial for his body is so sweet. Cool to use the vial for his body. LOVE all the blues too! Wonderful! Great canvas!! love the butterfly!! What a beautiful Butterfly! Great use of memo pins. Your canvas is amazing and love that quote! Love your take on this technique. GREAT CREATIVITY Yvonne - even with a hurt back. This is really lovely and your sentiment really got me thinking.... still thinking... not sure I know the answer either!! Love the way your technique came out and the colors you put together. Your butterfly is very special. A project to be proud of - for sure. j.
Fabulous canvas with great use of eroded metallic technique! Your butterfly is stunning! Love all the beautiful details! Fantastic piece, Yvonne! Genius use of gold filled bottle! LOVE the butterfly! Thanks for the inspiration! I agree... It looks like you do tjis technique every day! It's perfect! Lovely butterfly-got some ideas brewing up now! What a wonderful canvas. I adore the effect on the butterfly. The glitter in the jar is just the sparkle to finish it off. Love this piece, Yvonne! Your eroded metallic turned out so well! I love the fact that you did your butterfly the same way! Gorgeous! I love butterflies and I love this!! Your stuff is always an inspiration! Hoping someday I can go on one of these vacations and learn some new tricks from you all! Totally love your eroded metallic background but I can't take my eyes off the butterfly - what a cool body! Your background is really gorgeous!! 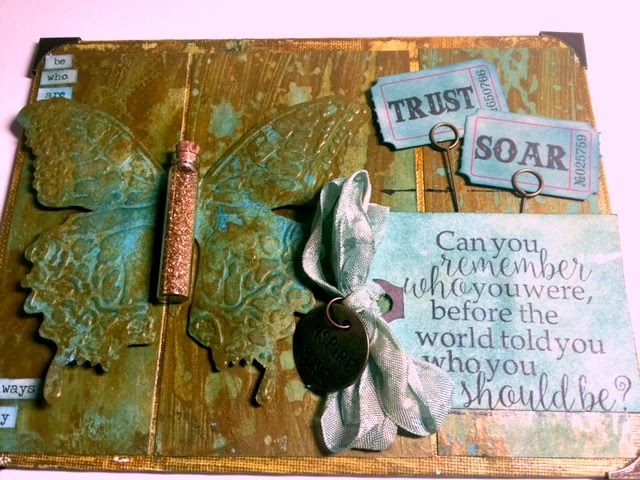 I love Tim Holtz Butterfly Duo and you did a great job with the technique on it and the background. What a wonderful butterfly, and I love the idea of using three tags to get the background for the canvas. Wow, the butterfly turned out really cool! This was the first time I tried this, too; there was definitely a bit of a learning curve, but well worth it to keep at it. Of course, one can never have too much glitter, am I right? You did a lovely job with this technique. Wow, Yvonne, it looks as if you've been doing this all your creative life! Great use of the technique both on the background and on the butterfly! Thank you for all your inspiration! Beautiful Canvas!! (not just because of the butterfly!) Who made the saying stamp? It's perfect. Hi Kim...the stamp is one of mine, wink. It is produced my Impression Obsession. Thank you so much! It is absolutely amazing how you have applied the technique metal eroded! beautiful, beautiful canvas! Wonderful canvas and the butterfly looks awesome with the EM technique! Love the bottled body!! What a beautiful canvas, the eroded metallic technique is absolutely perfect on the butterfly! Gorgeous! Love how you did your butterfly! I love your butterfly projects Yvonne. =) This is beautiful! Yvonne I love what you did with the Eroded Metal Technique. Your butterfly is to die for and nice touch using the glitter filled vial for the body.